Ball ceremony...with 3 current seniors and head coach. I spoke of my 13-year-old daughter, Lindsay. I also have a son, Michael, who is 20 and a sophomore at Kent State East Liverpool; a daughter, Samantha, who is 18 years old and a freshman at Cleveland State University; and finally a daughter, Addison, who will be 3 years old on Dec 17. I'm married to Rich Hoppel, a local attorney. It didn't feel right only speaking of my 13 year old. lol. I'm sure the older kids will enjoy reading this interview also. Some Additional Information about Some of Wendy's Relatives. This will be a foundation for additional high school and non-high school sports articles for the web site. My parents' names are Richard and Patricia Baker. My father passed away a couple years ago. Both were highly instrumental in my developing the skill I did and were my biggest fans. I spoke to my mother; she was able to talk to a couple of my uncles. I will add this info, you can decide what of it, if any, you'd like to use. Sometime around 1942-43, my maternal grandfather, Robert Campbell was part of the New York Yankees AAA squad. He was a short stop . . . playing in right field was YOGI BERRA! My two older uncles recall going to a picnic at Yogi's house even. My grandfather was doing great, but then was drafted into the Marines. He was then sent to Camp Pendleton in San Diego with my grandmother, Thelma, and their two sons, Bob, Jr. and Bruce. Prior to departing from San Diego to be sent to Japan, he was pulled from his troop to play baseball for the Marines! My oldest uncle, Bob Campbell, Jr., was drafted by the San Francisco Giants to play baseball in their farm league. During his first practice, he slid into third and ruined his left knee-end of story. My uncle, Rex Campbell, was Beaver Local's all-time leading scorer for years. He was drafted out of high school to play with Detroit Tigers as catcher. He turned down their offer and went to college instead (my grandparents insisting). He's currently in BL hall of fame. My cousin, Ryan Campbell (Rex's son), received a full athletic scholarship to Winthrop College in Rock Hill, SC to play baseball. He is also in Beaver Local's hall of fame. All this coupled with my paternal grandmother Katherine Baker may be partly the reason why dribbling came so easily. Sports played a big role in my family over the years. My maternal grandparents-Bob and Thelma Campbell, were also huge to me during my high school/college years. My grandfather video'd and did stats for me during all of my high school years-and continued even into college...My parents and grandparents NEVER missed a game-even in college, sometimes driving 4 and 5 hours one way to see me play. My grandfather is responsible for any stat sheets you found in my collection..He kept a wonderful piece of history for me. H.S. : History is what it is all about. Thank you Wendy. We had some fun yesterday afternoon [May 1, 2013] at the High School Softball field. Wendy Baker Hoppel, her 14 year old daughter Lindsay and someone with a camera took a few pictures. The passing of the torch remark fits because Wendy Baker played softball and basketball at ELHS from for 4 years ending in 1989. She played those two sports so well that she is a member of the ELHS Athletic Hall of Fame, the OVAC Athletic Hall of Fame, the only female member of the very exclusive ELHS 1000 point club in basketball. She holds a number of records in softball and basketball. As far as we know at this point in time she is the winiest pitcher in ELHS softball history as well as having the most strikeouts. Her daughter Lindsay is currently in 8th grade. She will be a freshman next year at ELHS and is planning on playing Volleyball, Basketball, Softball and hoping to be on the track team as well. (Yes there has been a Lady Potter who participated in both softball and track at the same time a few years ago). Thus symbolically we had a passing of the torch "ceremony" yesterday with Wendy pitching to her daughter, Lindsay. A PS to this story. 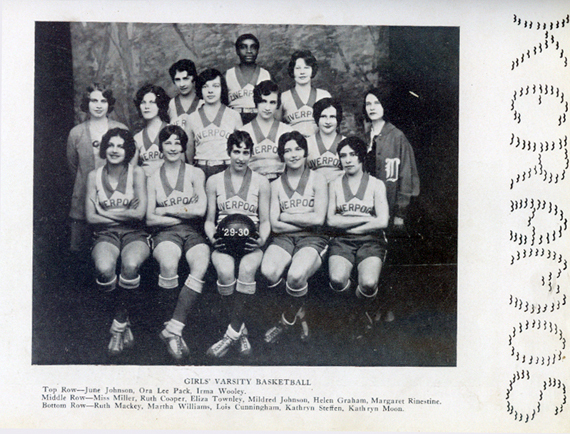 Wendy Baker Hoppel's grandmother played varsity basketball at ELHS in 1930. Unfortunately there was no passing of the torch in that case since her grandmother died when Wendy was only about 8 years old. A little warming up first. Say good bye to the "no-hitter", that ball is going to be hit into the outfield. A unique distinction is, she has been the only Potter athlete, male or female, to have been inducted into a second High School Athletic Hall of Fame having been inducted in the OVAC Hall of Fame in 2006. This site is the property of the East Liverpool Historical Society. Regular linking, i.e. providing the URL of the East Liverpool Historical Society web site for viewers to click on and be taken to the East Liverpool Historical Society entry portal or to any specific article on the website is legally permitted. Hyperlinking, or as it is also called framing, without permission is not permitted. Legally speaking framing is still in a murky area of the law though there have been court cases in which framing has been seen as violation of copyright law. Many cases that were taken to court ended up settling out-of-court with the one doing the framing agreeing to cease framing and to just use a regular link to the other site. The East Liverpool Historical Society pays fees to keep their site online. A person framing the Society site is effectively presenting the entire East Liverpool Historical Society web site as his own site and doing it at no cost to himself, i.e. stealing the site. The East Liverpool Historical Society reserves the right to charge such an individual a fee for the use of the Society’s material.